One of the many reason I love being a freelance photographer in Arkansas. I love my job, every damn day. I feel very fortunate that I am always happy to go to work and that I get paid to do something I love. Those words are so true. Sometimes I don’t get to spend too much time with my subjects, but in that time I have to pull out their personality so it reflects in their portraits. Other days I get to spend a large amount of time with them and really listen to what they have to say. That was the case when I photographed Robert Runyon for Out Here Magazine, put out by Tractor Supply Company. Runion is a self-taught craftsman and constructs log cabins with hand tools and two mules. He lives on 200 acres in Winslow, Arkansas, where I traveled to photograph him. All of the coordination for the shoot was done through his girlfriend who lives in a home on top of Mt. Gayler, since Runyon lives a bit outside of cell phone range in a nearby valley. As we planned the shoot, she had to ask what kind of car I drove because there is always a concern about being able to make the 3.5 mile trip down a gravel road to his cabin. Luckily my car of choice, a Subaru, is perfectly suitable for back roads in Arkansas… and let me tell you that this is the worst one I’ve ever been on. I’ve never doubted where my car could take me, but this day I was a little concerned as we traveled to his home in the middle of nowhere. His cabin has been a work in progress for many, many years. He raised his children in the home that has no public electricity, modern amenities (tv or computers) and is heated by a wood stove. Water for the home comes from a gravity flowing spring, and solar panels produce electricity to run the refrigerator, fan, lights and freezer. It is a truly beautiful place nestled into the peace and quiet of the woods. 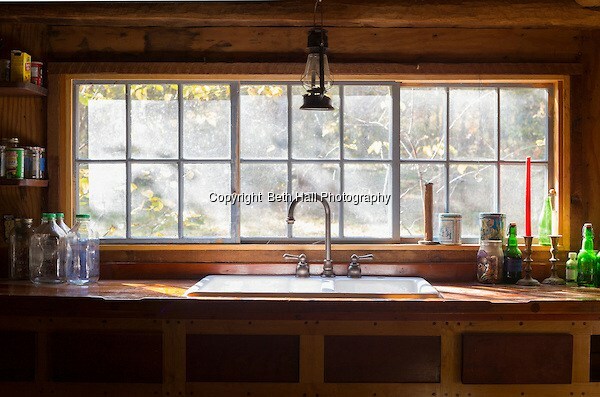 This photo taken at his kitchen window is among my favorite images I’ve ever shot. There’s something about the light and stillness in all of the interior images that takes me back to my college art history classes and reminds me of Jan Vermeer paintings. Runyon showed me part of his collection of hand tools that were all stored in carefully labeled wooden boxes in the upstairs bedroom of his home. He laid them out on a nearby bed as he talked about what each one was used for when building. The red blanket and dappled light coming in through the window made for a beautiful image of the tools. We spent the afternoon talking about his work, and his life. He introduced me to his Belgium-cross mules, Jenny and Jasper, that he uses to haul and hoist logs, as well as move native stones. They even did a little bit of work while I was there. In 2014, Runyan was named an “Arkansas Living Treasure” by the Arkansas Arts Council for his accomplishments in log and stone construction. It’s something I found out before I ever met him, otherwise I wouldn’t have known. He’s a simple man living in the woods with Athena his dog, his mules and homemade moccasins. It was a truly enjoyable time that was spent with him that fall afternoon in 2015. He is a really neat person, and artist.